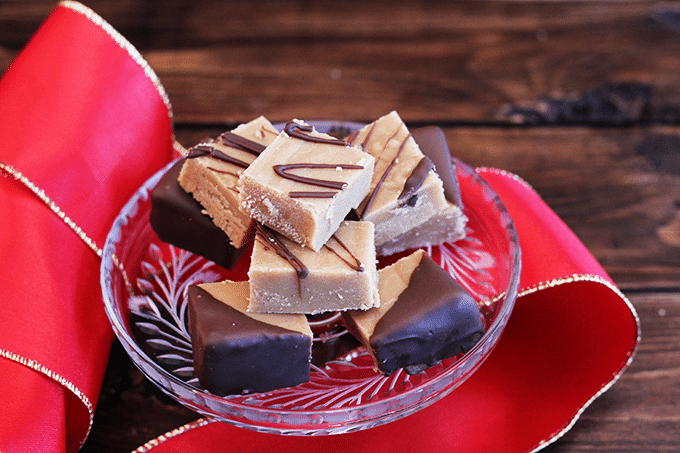 I don’t know if it’s just me, but I relate peanut butter fudge to Christmas. Well, I relate every fudge with Christmas. This recipe came from the same woman that introduced me to monkey bread. 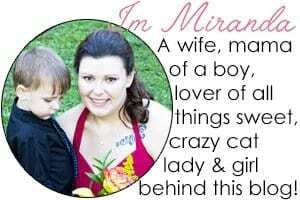 My mom’s friend and neighbor, Vicky. There’s no neighbor like a neighbor that loves to bake and bring goodies over to your house. Unfortunately, that’s not the case where we’re living now. Everyone here pretty much keeps to themselves except for a little wire haired dog from next door. He’s the friendliest little guy. Just Sunday Wesley went to let our two dogs in and found the little dog traipsing in along side ours. The cats weren’t especially fond of that idea. I couldn’t help myself, I had to dip a few into some coating chocolate. It was everything I knew it would be. I think it really added to the presentation as well. 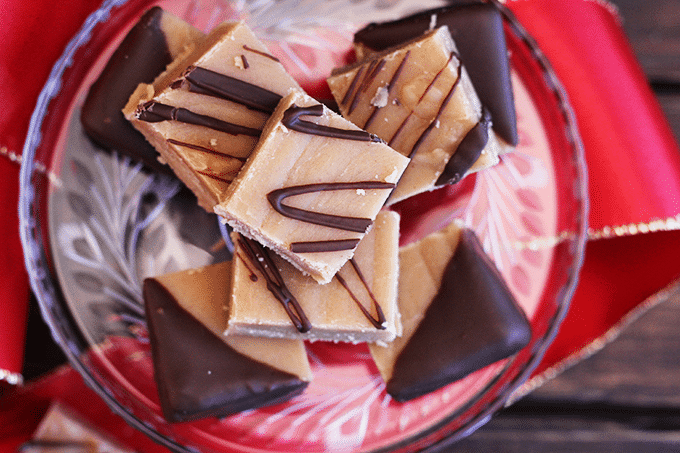 If you give this fudge out for a gift, a little drizzle of chocolate on the top makes it look a little more fancy schmancy. I tell you, I keep looking at my recipes I’ve posted and I’m definitely peanut butter crazy! I need to pull myself away from the stuff, it’s like my crack. Straight up crack. Highly addictive. 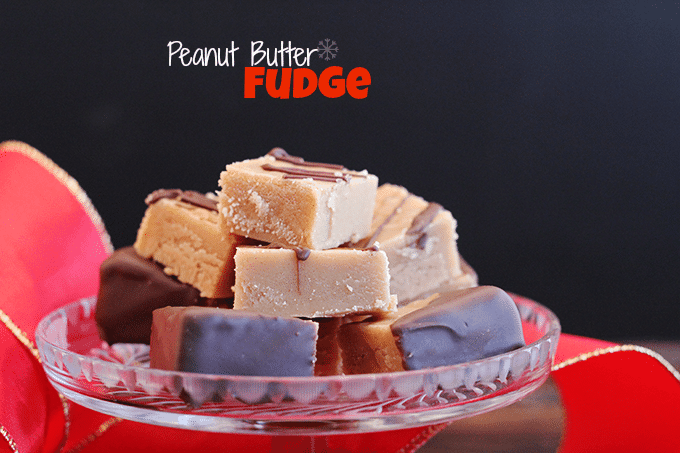 The best peanut butter fudge recipe you'll find. Line an 8x8 pan with tin foil. Set aside. In a large saucepan, add in the sugar, milk, and butter, Turn the burner onto medium and stir until everything is dissolved. Measure out the peanut butter and have it ready. Using a candy thermometer, bring the mixture up to 236-239 degrees or soft ball stage. Stir occasionally. Remove from heat and quickly add in the peanut butter. Stir until the peanut butter is completely combined into the sugar mixture. Pour into the pan and place into the fridge into chilled. It will probably take 30-45 minutes. Cut into small squares. Microwave the coating chocolates in 20 second intervals until completely melted. 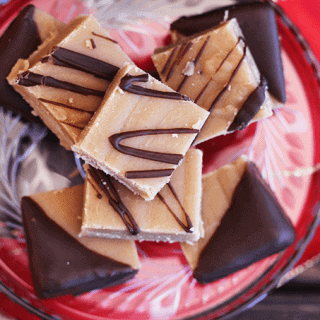 Using a spoon, drizzle the chocolate over top of the fudge squares. Let the chocolate set. Thank you Vicky for the recipe!